Have you ever heard of online STI dating? Dating is tough enough but imagine how isolating it can be for those suffering with incurable sexually transmitted infections. There has been a rise in the number of websites tailored specifically to meet the needs of those people. There are loads of niche dating sites, but the STI dating sites have seen the biggest growth. There are sites aimed at those suffering from more serious infections such as being HIV positive, and sites for those with the most common types of incurable infections, such as genital warts and herpes. These sites promise that life with a diagnosis is not over, but is in fact, just the beginning. 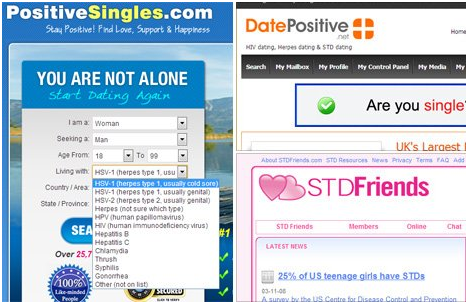 Two hugely popular sites include PositiveSingles and DatePositive, which allow users to search for others with just about any type of sexually transmitted infection. PositiveSingles has 30,000 users in the UK alone. The Center for Disease Control and Prevention states that each year there are approximately 110 million new cases of STIs. Many such infections are curable, such as chlamydia. Gonorrhoea and syphilis can be treated with antibiotics, but infections like HPV and HIV are not curable at present. For those with incurable infections, dating can become fraught with difficulty, hence the popularity of specific sites now for those with STIs. People make assumptions that those with STIs have had many sexual partners, although many people contract STIs from long-term partners who have been unfaithful. Discussing such matters with a person you’ve only just met is terrifying to most. Too soon, and they might run a mile – too late, and you risk losing trust. Such is the level of fear that some give up on dating altogether. For these people, STI dating sites are a lifeline, where users can discuss as little or as much as they like about their condition. When you can communicate with people who have had similar or shared experiences, there is support, understanding and an acceptance that helps you feel part of something like a community. STI dating sites also offer more than conventional sites, in that there are often counsellors available, information and special targeted events.